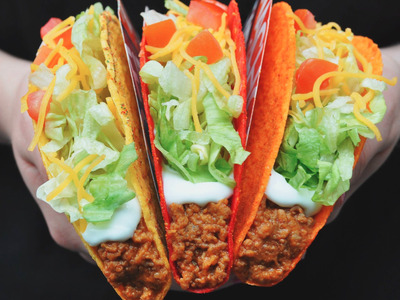 Taco Bell is giving away free Doritos Locos Tacos today from 2 to 6 p.m. The fast-food chain promised in May to give away the free food if an away team “steals” a win during the 2016 NBA finals. The Golden State Warriors did just that when they beat the Cleveland Cavaliers in Cleveland in Game 4 of the NBA finals. The Cavaliers eventually became the NBA champions, but Americans have the Warriors to thank for the free food. To pick up your free Doritos Locos Taco, Taco Bell customers can go to any participating location in the US between 2 and 6 p.m. on Tuesday, June 21. Each customer can pick up one free taco, typically priced at $1.49. This isn’t the first time Taco Bell has given away food after a sporting event. In November, Taco Bell spent at least $10 million giving away free A.M. Crunchwraps after losing a World Series bet.